Cognac isn’t just an after-dinner drink. It’s a charming town in the Charentes region of southwestern France, where I’m told the sun shines no less than 330 days of the year. Though I would have loved to spend time wandering the town, which gives its name to one of the world’s most famous types of brandy, I was on a mission. 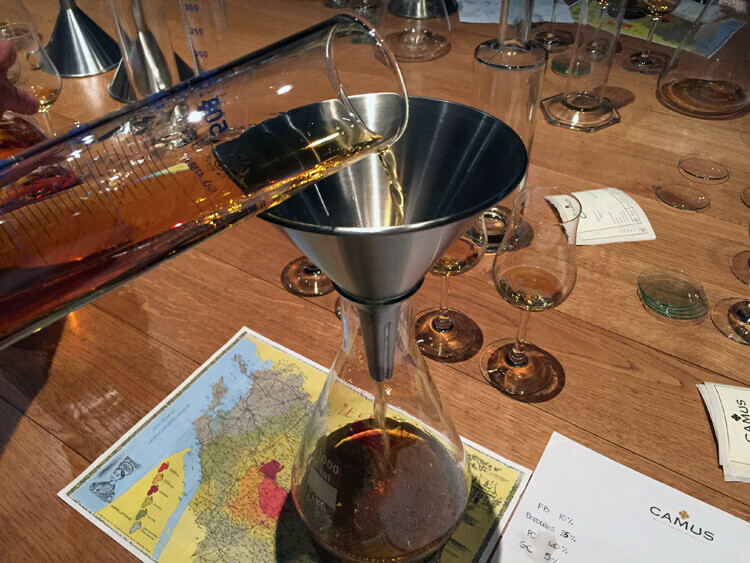 I was headed to Camus Cognac (pronounced CAM|ooo), where I’d be blending my very own Cognac. 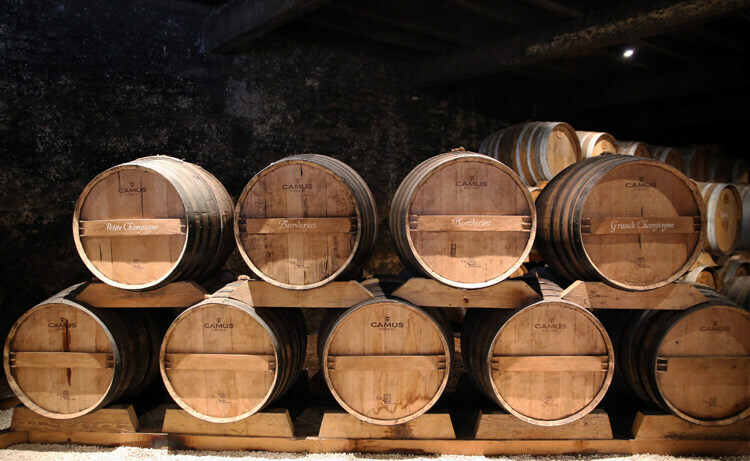 What exactly is cognac? Technically speaking, it’s a type of brandy made from double distilling wine and then aging it in wooden casks. Why not just call it brandy then? Just like Champagne can only be labeled Champagne if it was produced in the Champagne region of France, Cognac can only be labeled as such if it was produced in the Cognac area and under very strict regulations. I learned all this and more at the small museum at Camus Cognac, which has been run by five generations of the Camus family since 1863 and is the sixth largest Cognac producer in the world. After the short lesson about what exactly Cognac is and how it is produced, it was time to get down to business…the business of blending my very own Camus Cognac XO. The first question I had as someone basically new to Cognac, was what did the XO mean? These letters indicate the quality and are controlled by the length of time the Cognac ages in their oak barrels: VS (Very Special), VSOP (Very Superior Old Pale) and XO (eXtra Old). Of course, I’d be blending the highest quality Cognac. Now, this is the kind of science I can get in to! 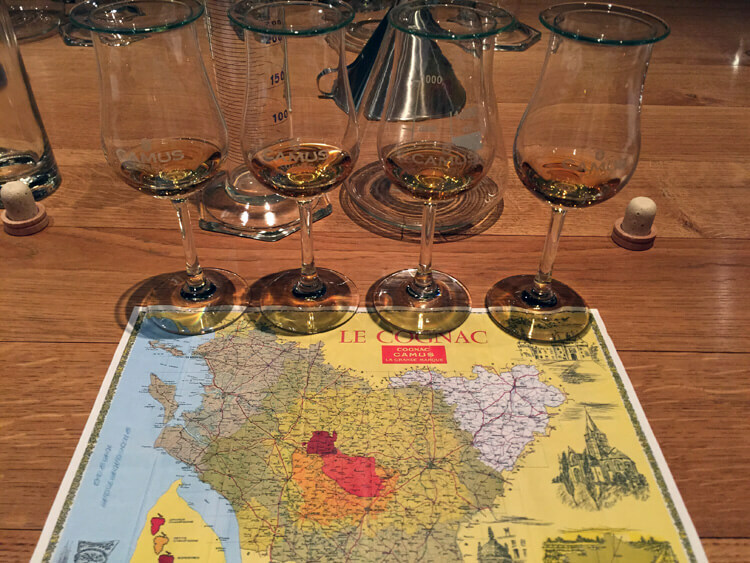 My questions answered, the blending session began with Master Distiller, Jacques, guiding me through a tasting of the four different Cognacs I’d be using to make my blend: Fins Bois, Borderies, Petit Champagne and Grande Champagne. Each, just like wine, had their very own tasting notes. I scribbled away on my notepad, noting percentages of each with the hope of blending a delicious Cognac. Why wasn’t science class this fun? Fins Bois, Jacques told me, is a great base to help the other Cognacs express themselves. Borderies is the most important Cognac in the Camus blends because these grapes come from the family’s very own vines. It has notes of vanilla and cream, and is naturally sweet. Petite Champagne is aged about 20 years in the cask and is masculine with spicy notes of cinnamon. Grande Champagne, aged 40 years in the cask, is a fully mature Cognac with rich notes of leather and cigar. Finally deciding the percentages I would use, I grabbed my beaker and took it to the casks to fill it up with each of the four Cognacs. I was then instructed to pour it in to another beaker and swirl it around to blend all the Cognacs together. Finally, I funneled my blend in to its bottle and recorded it all in to Camus’ official registry book. With my recipe recorded, I can re-order a bottle of my very own Cognac any time. My label was affixed to the bottle, the bottle sealed, and it was packaged away in to a lovely wooden box for safe keeping. It will need to stay there for at least six months while it further blends and ages in the bottle before we can try it. I’ll admit that even after my visit to Cognac and blending my very own unique bottle at Camus Cognac, I’m still not much of a fan. Cognac is just a bit strong for my tastes (it is 42% alcohol after all! ), but the blending course was like doing a really fun science experiment. Maybe my very own blend will change my mind? I guess I’ll find out in about six months! The Camus Cognac Master Blender Workshop is available as an additional excursion on Viking River Cruises’ Chateaux, Rivers & Wine and is €184 per person, which includes transportation from and to the ship. If you are visiting Cognac, you can also book the Master Blender Workshop with Camus Cognac and it is €160 per person. My Camus Cognac Master Blender Workshop was provided by Viking River Cruises as part of my Chateaux, Rivers & Wine cruise in order to bring you this story. However, Luxe Adventure Traveler maintains full editorial control of the content published on this site. As always, all thoughts, opinions, and enthusiasm for travel are entirely our own. I’ll bet this workshop was a blast and I am so envious of that Viking River Cruise you took – I’ll bet it was incredible! I want to do that! What a fun event! I would go to science class everyday if it included making cognac! I always love food, wine and spirits classes so this one looks like a blast. What a fun class! I would go to science class everyday if it meant I could make cognac! A Viking River Cruise is something I’ve always wanted to take and what a wonderful excursion this was. I would love to do this! I’m not a drinker, but I can see how this would be really fun and informative! !